Sliding in here at the last minute with a BBCC entry! Enjoy. The abdomen's a bit long and the top of the head's kinda blocky, but the overall aesthetic's pretty solid. I really like the eyes. Thanks! Meaning like the little spider pet Black Phantom had? 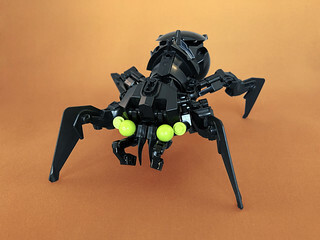 I actually don't remember too many HF spiders. A little bit of blockiness inherent in building off the big CCBS paw piece, yeah... thanks for the comment though!